The birds don’t need to see the Equinox on the calendar to know that spring is here. Here in western Arizona, they’ve been on the move for a few weeks now! Lucy’s Warblers are in full song on territories, Bell’s Vireos are starting to set up shop, and some of the migrants such as Warbling Vireo and Wilson’s Warbler are starting to trickle in. Besides the various first of season dates that we aim to set every year, one of the most exciting events of spring migration in Arizona is the North American Migration Count (NAMC). The NAMC is a lot like the Christmas Bird Count (CBC): a single-day count of every bird within a designated area, with participants of all skill levels invited to attend, compiled and compared against the years and with other areas. There are some major differences. While the NAMC is nationwide, not every state holds it; Arizona’s is run by Arizona Field Ornithologists. And instead of a big circle, the NAMC area boundaries are county lines. This means that any point in Arizona is up for grabs on Saturday May 10 this year! For the past few years, I have compiled La Paz County for the NAMC. It is a unique county in many ways: it’s big, it doesn’t have a lot of montane habitat (okay, it has very very little), and it has zero birders actually living in it. This makes it a bit of a challenge to find participants! Still, we get big results. In 2013, even though we only had five intrepid participants, we still counted 2,261 individuals of 133 species. That ranked La Paz #9 for total individuals and #7 for species diversity (out of 15 AZ counties). Not bad, all things considered! If you’ll be around for a fun day (or even just a few hours) of birding in La Paz on May 10, drop me a line at lbharter at gmail dot com! To read more about the NAMC or to find contact info for other county compilers, click here. The most numerous species in La Paz County for the NAMC 2013 was Western Grebe, which I don’t have any photos of. 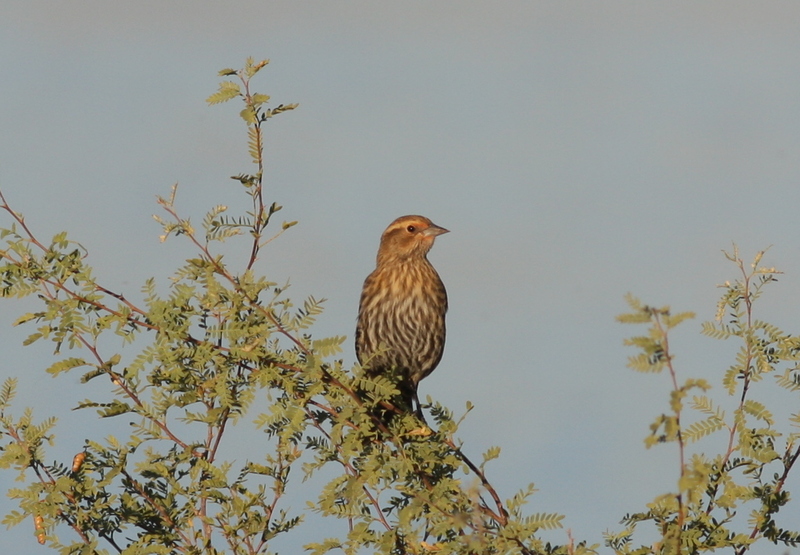 #2 was Red-winged Blackbird! I live in Lake Havasu City, Arizona, where I work as a field biologist and spend as much of the rest of my time as possible looking at (and listening to!) birds. This entry was posted in AZFO, Events, La Paz County, Migration, North American Migration Count and tagged North American Migration Count. Bookmark the permalink. I’ll have my people get in touch with your people. I was in the Phx-Scottsdale area (where I grew up) last week. I was on a ‘quest’ to find bees in the desert. (I’m a natural type beekeeper in Oregon.) I wanted to take videos of bees on desert plants and flowers, something to spice up my green Oregon beekeeping blog. While walking around in the mid-morning, I was absorbed by the many birds singing. I can’t remember hearing so many as a kid. Maybe it’s unique to Scottsdale area where our rental is located. I even spotted some green parrots in a saguaro cactus. I’d like to document the videos. Is there any chance I can send you photos of some birds for you to identify? I just would like to name the bird without saying “Unknown bird chirping on palm tree,” or “bird running fast across open space”. I know this is asking a lot, but if you get time could you ID the black bird and the bird hanging on the palm tree. I thought it might be a cactus wren. In the video you can hear many different bird calls. If I knew them all, I’d redo the video with captions naming them. Nice footage! The bird on the palm tree is a Gila Woodpecker, and the black bird is a European Starling. You were right about the Mourning Dove! And, those green parrots are Rosy-faced Lovebirds. Thanks for the ID’s. With your permission, I’ll link your web site up.